The latest arc of Runaways written by Terry Moore (Strangers in Paradise, Spider-Man Loves Mary-Jane) and drawn by Humberto Ramos (New X-Men, X-Men) has been nothing short of mediocre and, unfortunately, this latest issue only turns up this mediocrity. The main problem is trying to care with this latest arc. After the big reveal last issue that the reason for all the kids problems does not stem from a lack of direction or teenage insecurities and drama, but the side-effects of a spell cast by the Runaways leader, Nico. This reduced to the series to a level of absurdity only outdone by the art, which defines itself as hyper-exaggerative. Terry Moore really does not succeed at much this issue. There are barely any laughs, something Moore did well early on and an element this series has always possessed. Really the only laugh is Molly surmising the captive alien they had was “just a giant booger hiding in human form,” even that falls very short. But the problems don’t end at no humour, Moore simply fails to deliver a narrative which gives any sense of urgency or necessity. Yes, the Runaways “scattered” in spirit and are all mad at each other or simply apathetic towards things, but this apathy just reflects onto the reader. It’s hard to care. The entire issue revolves around Victor and Nico finding all the Runaways and getting them back together. This happens through the repeated use of practically the same dialogue. By the time the entire team is back together the same speech, not identical but practically the same, has been given three times and then Moore gives it to the Runaways againin case they missed it. It just feels like one thing happened over and over again, and four times in a thirty page comic is too much. Thankfully, the Runaways will have something to punch next issue and maybe the entire thing will come back together. 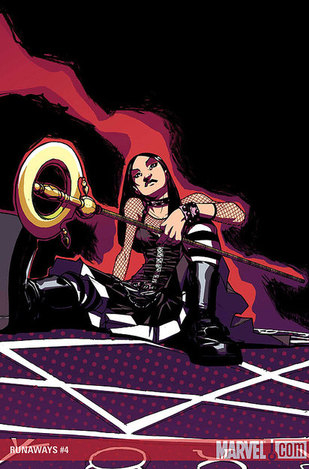 Seems Nico’s spell affected Terry Moore as well, its scattered and making things much to disconnected. and feel it is inappropriate for the feel of the series. The sheer amount of exaggeration creates an air of silliness and childish antics. Runaways has always been much deeper than this and the artists have always recognized this. But Ramos’ style seems dead set on making the bug-eyed Runaways as silly looking as possible. 4/10 The series is getting worse, hopefully it will start to get better as this arc wraps up, and maybe dump Humberto Ramos on the way.